It won't be the fastest Atlas rocket at liftoff but next week's inaugural Atlas 5 will be the largest and mightiest ever flown by Lockheed Martin. Liftoff remains on schedule for Wednesday at 6:05 p.m. EDT (2205 GMT) from Complex 41 at Cape Canaveral Air Force Station, Florida. An 89-minute launch window will be available that day, through 7:34 p.m. EDT (2334 GMT), to get the rocket airborne with its European TV satellite cargo. Two backup launch opportunities have been scheduled for Thursday and Friday, if needed. The windows are 6:04 to 7:31 p.m. EDT and 6:04 to 7:28 p.m. EDT, respectively. The 9-hour, 40-minute launch countdown will start at 7:45 a.m. Wednesday as the Atlas first stage and Centaur upper stage are powered on. Much of the day will be spent running final checks and preparing for fueling operations, which are slated to start at 3:40 p.m. EDT. After a planned 10-minute pause in the count at T-minus 4 minutes, the computer-controlled launch sequencer takes over, guiding activities to liftoff. At T-minus 2.7 seconds, the Russian-made RD-180 main engine will be ignited, building up thrust and undergoing a diagnostic test to ensure all is in readiness for the Atlas 5 to begin its maiden voyage. At liftoff, explosive bolts will fire to release the 191-foot tall rocket from three hold-down posts on the mobile launching platform, allowing the vehicle to leave the grasp of Earth. The trip to place Eutelsat's Hot Bird 6 spacecraft into a supersynchronous transfer orbit will take 31-1/2 minutes, as the rocket flies from the eastern coast of Florida, southeast across the Atlantic and deploys the satellite in the skies above west-central Africa. The Atlas 5's first stage weighs 60,000 pounds more than current Atlas vehicles. That extra weight means the rocket will be slow to climb off the pad, taking an estimated 13 seconds to clear the lightning protection masts around the complex. "This vehicle is not the fastest riser. You've seen Atlas 3s leap off the pad, and then we throttle up after we clear the pad, we disappear in a hurry. This vehicle is going to look more like an Atlas 2," said John Karas, Lockheed Martin's vice president for Atlas 5 development. "(Atlas 5) has a 1.2 thrust-to-weight (ratio), so it will probably take from the time of first motion to the time it clears the top of the lightning tower over 10 seconds. 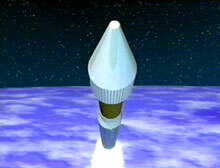 Atlas 2s are slower; they are only 1.14 thrust-to-weight. Atlas 3s are 1.5. Once you see a few Atlas 3s you are spoiled. 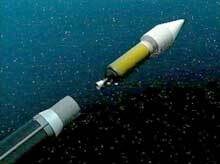 So just think of a standard Atlas 2A launch and that will be more like it." Atlas 5 lifts off at full throttle before stepping down a tick to 99 percent at about T+plus 15 seconds. At T+17 seconds and approximately 800 feet up, the rocket will begin its programmed pitch and roll programs, tilting over slightly for the trek downrange. The RD-180 engine continues at the steady throttle setting of 99 percent until T+plus 1 minute, 40 seconds when the powerplant eases to 95 percent just after passing through the area of maximum dynamic pressure, or MAX-Q. 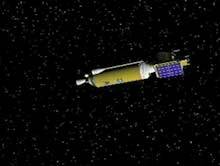 Satellite payloads don't like stresses above five times Earth's gravity, so once that limit is reached about 3 1/2 minutes into the flight, the engine will gradually throttle down to maintain the loads being experienced. As the stage's fuel supply is used up, the engine is throttled back to minimum thrust levels and then shuts down at T+plus 4 minutes and 1 second. 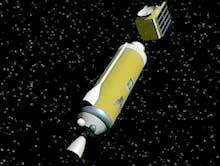 The spent stage is jettisoned from Centaur upper stage as eight retrorockets fire for a clean separation at T+plus 4 minutes, 9 seconds. With a safe distance between the two stages, the Centaur's RL-10 main engine is ignited at T+plus 4 minutes, 19 seconds to continue the push to orbit. 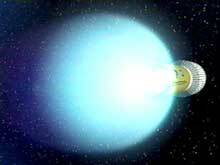 The single engine consumes liquid hydrogen and liquid oxygen cryogenics and is capable of firing several times during one launch. The two-halves of the rocket's nose cone that shielded the payload during the climb through Earth's atmosphere is no longer needed by T+plus 4 minutes, 27 seconds, allowing the shroud to separate and fall away. 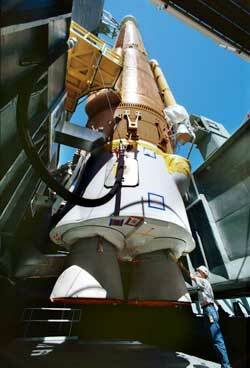 This first Centaur burn lasts until T+plus 15 minutes, 11 seconds, injecting the stage and attached Hot Bird 6 spacecraft into a temporary parking orbit around Earth with a low point of 107.6 nautical miles, a high point of 800.0 nautical miles and inclination of 27.4 degrees to the equator. The duo coasts in that orbit for nine minutes until the Centaur fires again at T+plus 24 minutes, 12 seconds, accelerating Hot Bird into the planned deployment orbit of 170.0 by 24,757 nautical miles at an inclination of 17.57 degrees. 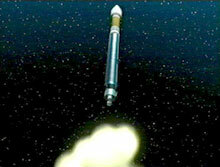 Unlike some Centaur missions that see the stage fire until it depletes its fuel supply, this launch is a "Guidance Commanded Shutdown" flight in which the onboard computer will cut off the engine when the desired orbit is reached. 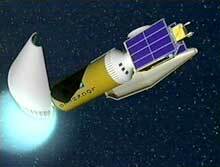 The expected engine shutdown to complete Centaur's second burn is T+plus 28 minutes, 26 seconds. Centaur will perform some maneuvers to orient itself into the proper position to release the satellite at T+plus 31 minutes, 36 seconds, completing the first launch of Atlas 5. To gather as much data about the new rocket's performance, engineers have outfitted the stages with an unprecedented amount of research and development instrumentation. Two cameras are also mounted aboard to transmit live video of the launch back to the ground. 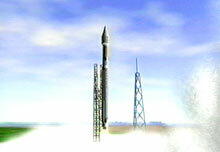 One is positioned on the outside of the first stage; the second is on the Centaur, inside the interstage section, to focus on the RL-10 engine. 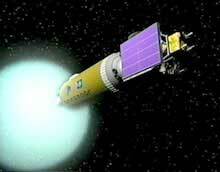 Once the first stage with the interstage separates, the Centaur camera will show the spent booster falling away. These same camera positions were used on the first Atlas 3 in 2000. "We are launching at about same time of day, the sun will be high in sky, so I expect to have some really, really good video just like (Atlas 3)," Karas said. Once flying on its own, Hot Bird 6 will perform a series of onboard engine firings to achieve a circular orbit 22,300 miles directly over the equator. 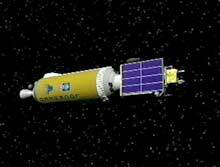 It will be parked at 13 degrees East longitude in geostationary orbit where the craft will match the Earth's rotation, appearing fixed above one spot of the globe. Paris-based Eutelsat will use the satellite to relay digital TV and radio programming to homes across Europe, North Africa and the Middle East. Data source: International Launch Services.